He said they failed to provide needed infrastructure despite huge revenues, even as he singled out Olusegun Obasanjo, who was president from 1999 to 2007, for spending over $15 billion dollars on power without achieving much. Mr Obasanjo, a former supporter of Mr Buhari, is one of the fiercest critics of the incumbent president. He had in January written a damning letter to Mr Buhari asking him not to seek re-election in 2019 due to poor performance. 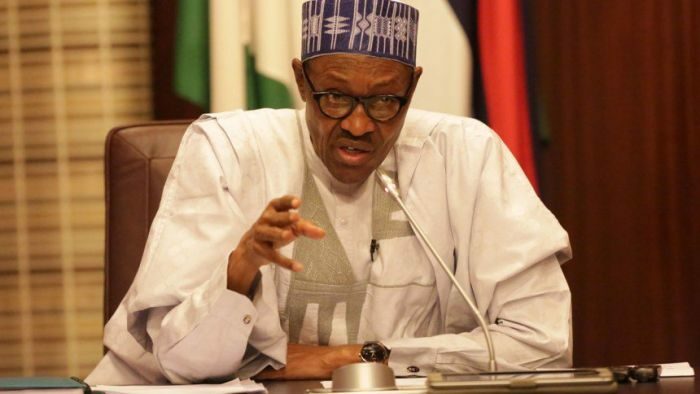 Speaking when he received a delegation of Buhari Support Organisation (BSO) at the Presidential Villa Tuesday, the president said he often wondered why people in authority chose to send their children outside the country to acquire education while they fail to develop the country. “I wonder want kind of Nigerians they want their children to come and work with. I think there is a lot of lack of imagination. “Because if you’re fighting for the country then you shouldn’t be misappropriating or misapplying the fund the way people do,” he said. Mr Buhari thanked members of the support group for standing by him without being prompted to do so. “Nobody is paying you for what you have been doing. It is because from the bottom of your hearts; you exposed yourselves by identifying with me through opposition to success and after the success. “I don’t know how many of you people will say what the hell you got out of it. You can only get satisfaction through voluntary and understandable way of believing in issues you do. The president told the gathering that he recently made some statements. He said because some of them may have missed it due to absence of electricity, he had to repeat it. He said he threw a challenge to anyone to check either in Europe, Asia or America that between 1999 and 2014, Nigeria was producing 2.1 million barrels per day of crude at an average cost of $100 per barrel. He said the price even went up to $143. “So Nigeria was earning 2.1 million times 100 times 16 years, 7 days a week. “When we came, it collapsed to $37-38 and it was oscillating between $40 and $54 sometimes. “ I went to the Governor of Central Bank, thank goodness I did not sack him, he is still there. I went with my cap in my hand and say oya. He said there was no savings, only debt,” Mr Buhari said. During the 16 years the president referenced, Nigeria was governed by three presidents, Olusegun Obasanjo (1999-2007), Umaru Yar’Adua (2007 to 2010), and Goodluck Jonathan (2010 to 2015). PTF is the Petroleum Trust Fund set up by late Head of State, Sani Abacha, in 1994 to utilise the proceeds of a petrol price increase. Mr Buhari headed the PTF, which was reputed to have constructed many road projects across the country while the military dictator stole Nigeria blind. Mr Buhari, who has been criticised for looking the other way while Mr Abacha stole billions of dollars from public treasury while in office, again justified his working with the dictator. He said the agency also intervened in education and medical care among others. Mr Buhari also said the railway in Nigeria “was killed and one of the former Heads of State between that time was bragging that he spent more than 15 billion American dollars, not Naira, on power. Where is the power? Where is the power? And now we have to pay the debts,” he said, in apparent reference to Mr Obasanjo. Mr Buhari also came down hard on the members of the National Assembly. He also said unlike the previous administrations, he has made the highest provision for capital projects; N1.3 trillion; in the budget he took to the Assembly. “Let anybody come and confront me publicly in the National Assembly. What have they been doing? “Some of them have been there for 10 years. What have they been doing?,” he asked. He said his administration had uncovered some houses in Abuja, U.S. and Europe belonging to “some people”. He, however, said some of them “swore to God” that the houses do not belong to them. Mr Buhari said “but their accounts, through the banks, through their companies, show that it is their own. But they say it’s not their own. “This is a terrible thing and the people are saying what are we doing? Why can’t you lock them up? And again I went on by telling them what I said when I was in uniform, younger and rather ruthless. I got from the President downward and I locked them up in Kirikiri and I said you’re guilty except you prove yourselves innocent. “I myself was locked up and those who misappropriated public funds were given back what they had taken away. Who did anything about it? “Then I decided to come and put agbada. I tried one, two, three four times and God agreed,” he said. Mr Buhari said when he ran for office for the third time and went to the court afterwards, his lawyer, Mike Ahamba, who, he described as “a Roman Catholic and Ibo man” requested the panel of judges at the Supreme Court to order for register of voters in some constituencies across the country be provided for vetting and confirmation of the election outcome. He said the Supreme Court rejected the request and asked him to approach the electoral commission instead. The president said that at the end, the court ruled against his petition except one judge, who, he, again described as” another Ibo man, a Roman Catholic” who wrote a minority judgment in his favour. “He was among the panel of the judges, he wrote a minority report in my favour. So, why this question of religion and ethnicity and so on? “People are worshipping the dollars, the Sterlings not to even talk of the Naira. “He wrote a minority report saying this is what we have decided. But the President of that court was my classmate for six years in secondary school; he is from my own state. So, please, we have nothing to regret. Absolutely nothing. “Since we all believe that God works in our hearts not in our talking. God help us, God help our children and grandchildren. “We will try as much as we can to work and bring this country to it senses. “God has given Nigeria everything; we are rich in human and material resources so let us keep praying to God that He should put people of conscience in charge at all levels,” Mr Buhari said. The president commended members of the BSO for supporting him over the years without expecting anything in return. #BBNaija: Watch Tobi And Cee-C Make Out Under The Sheets.